The essence of any communications campaign is to successfully deliver the message to the targeted recipients and make them react to it the way you wished. A strategically planned and structured public relations program helps ensure that the appropriate message appears in key media outlets at the best time to support the client's marketing goals. Our objective is to ensure that publicity, promotion, and advertising work together to maximize Return On Investment. LTA has the experience to translate ideas into coordinated, effective communications tools. From concept to completion, we stay focused on the client's target audience and specific objectives. In today's world of multi-media advertising, it is all about being consistent and breaking through the clutter to make sure your message is heard. Our expertise is helping clients to do just that with crisp, clean creatives that truly make a lasting impact. Effective copy works hand-in-hand with creative design. Clear communication is critical to delivering the message to the client's target market and motivating them to act. LTA offers clients full-service graphic design and production in a variety of mediums including print ads, brochures, logos, flyers, outdoor advertising, trade show displays, stand alones, digital media, and direct mail. 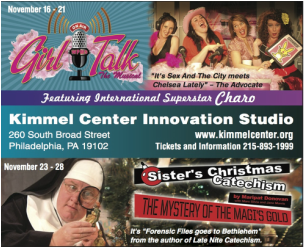 Producers of the off-Broadway plays "Girl Talk" and "Sister's Christmas Catechism" retained LTA to design and place various advertising collaterals for their Philadelphia engagements. Four Tops 50th Anniversary Celebration promo produced for use by local PBS affiliates throughout the United States. Media planning and placement is critical to the success of any advertising campaign. With so many options available, oftentimes it can be confusing trying to determine where to put a message, now many times it needs to run, and if the right people will see it. As media options have increased, mass markets have broken into smaller segments with distinctly different needs. The LTA team can design a strategic media plan that will reach your target market, and create memorable advertising tools that will make you stand out from the crowd. Sample radio spots produced for various LTA clients.